The second summit of US President Donald Trump and leader of the DPRK Kim Jong-un took place in Hanoi, the capital of Vietnam, on February 27–28. High hopes were pegged on this summit: the sides were expected to push forward the denuclearization process of the Korean Peninsula and also to reach agreements on the end of the state of war. It was even expected that some of the sanctions would be lifted from North Korea. However, these hopes did not materialize: although both sides tried to put a good face on the matter the summit was obviously a failure and ended ahead of schedule. Why did the sides fail to come to terms and what awaits us in the future? These questions were discussed by ru.valdaiclub.com with Professor of MGIMO University of the Russian Foreign Ministry, Director of the Center of Asian Strategy at the Russian Academy of Sciences’ Institute of Economics Georgy Toloraya, who had an opportunity to follow the developments on the spot. Why did the summit break down? If one relies on the confidential information leaked by the participants at the summit meeting, a conclusion can be drawn that the event was simply not prepared well enough because the sides failed to bring their positions closer together during various working contacts. The North Korean negotiators did not have enough authority and even competence to discuss the nuclear issue. They merely promised that the leader of the Korean people will bring “a big present” for Trump to Hanoi. At this point John Bolton, who is not a great friend of North Korea, received a favorable opportunity to lead the talks into a deadlock. In response to the absence of any clear explanations from North Korea, the Americans toughened their requirements and returned to the all-or-nothing paradigm as regards denuclearization and any reciprocal steps that seemed to have already been refuted forever. They not only renounced the tacit understanding that the process of reciprocal concessions should be synchronized and phased out but they also upped the ante in their requirements. At the last moment and quite unexpectedly, they included the destruction of chemical and biological weapons into the denuclearization process. They also posed a question about “a secret uranium enrichment plant” that is ostensibly located outside the Yongbyon Nuclear Research Center. The United States again raised the insoluble issue of North Korea’s “declaration of all its nuclear activities” and its detailed denuclearization roadmap. This position is nothing short of obstructionist. The Americans realize full well that it is impracticable: the announcement of this position is better designed for domestic consumption and also to compel the North Koreans into making the maximum concessions. The North Koreans were not ready for this since Kim only brought to Hanoi the already announced promise to eliminate the Yongbyon Nuclear Research Center. The Americans did not understand – at any rate at the working level – whether the Yongbyon Nuclear Research Center includes just the reactor that has been producing plutonium since the late 1980s and the facilities for processing fuel rods or whether it also includes the uranium enrichment plant comprising thousands of centrifuges and other facilities (there are dozens if not hundreds of them there). Indicatively, it was mentioned that the Yongbyon Nuclear Research Center is “obsolete” and is nothing special. Meanwhile, technical experts, including American scientists, are maintaining that this center is an important facility and “the heart” of North Korea’s nuclear program and that Pyongyang’s readiness to take such a resolute step is worth a lot because it will eliminate or seriously limit its capacity to produce weapons-grade fissionable materials, that is an opportunity to build up its nuclear potential. However, the Americans did not appreciate such readiness. 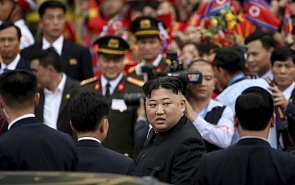 The North Koreans hoped that as a result of the summit meeting the sanctions would be partially lifted because the UN Security Council resolutions imply that if they take positive action on their nuclear program such an option should be discussed. The DPRK did quite a bit. It imposed a moratorium on nuclear and missile tests, mothballed or even eliminated its nuclear test site, and started destroying its missile testing grounds. It’s important to point out that they put emphasis on the removal of sanctions on the list of their requirements for US reciprocal actions not because this is a life-and-death issue for them but because they thought that a statement made on the end of the war and then the intention to enhance political ties discussed at the working level was a fait accompli. Their requirement for the removal of all sanctions after the year 2016 is more in the nature of a query. Apparently, the North Koreans would have agreed to the stage-by-stage easing of the sanctions because they even accepted the provision that the sanctions may be restored in case of any violations on their part. Faced with such insistence, the Americans made an unfounded conclusion to the effect that the sanctions are doing their job and therefore should be toughened up. As a result, the North Koreans got nothing. The Russian and Chinese proposals to alleviate sanctions were blocked in the UN Security Council by the United States. Now it transpires that the Americans did not even consider the possibility of mitigating the sanctions. Such a tough position voiced by Donald Trump after his consultations with John Bolton and Mike Pompeo appeared to be unexpected as well as unacceptable for North Korea, although both sides declared their intention to continue the talks. Indicatively, the North Koreans “have had their finger on the pause button” for as long as they could, delaying any tough response. During the first weeks after the unsuccessful summit meeting Pyongyang abstained from its negative assessments and did all it could to keep open the negotiating channels. It was almost three weeks later that Vice Minister of Foreign Affairs Choe Son-hui, who is trusted by Kim, made official comments to the effect that North Korea is not eager to have talks with the US on its terms of denuclearization and that soon relevant statements would be made on this matter. In the meantime, a campaign to discredit North Korea was launched in the US media and political circles. Thus, numerous reports appeared claiming that it became known at the last moment that the North Koreans continued some activities at their missile testing range. But the North Koreans did not promise to stop the relevant activities – they only promised to stop missile tests. The same is true of uranium enrichment. They did not promise to discontinue it, all the more so since enriched uranium based on its own raw materials is a major competitive advantage and is required for their future energy program. I think what we are witnessing is a massive campaign waged by the US administration, the Department of State and other agencies with a view to wrecking the talks and continuing a policy of isolating North Korea and putting pressure on it. That notwithstanding, the door to the talks still remains open. It is possible to hope for the time being that both sides are desperately bluffing, occupying maximalist positions in order to somehow promote the negotiating process of mutual concessions on a stage-by-stage and phased-out basis, although the Americans swear that they consider such an approach unacceptable. Some of Pompeo’s statements for the press about the need for “getting the sequencing right” sow doubts in this. Everyone understands that there is simply no other way. If Trump wants to score foreign policy gains for his election campaign in 2020, he will have to follow this track. Apparently, he still wants this in an attempt to try and turn North Korea from an enemy into a partner – probably, on the anti-China basis in a big geopolitical game in Northeast Asia. At the same time, the situation does not look too optimistic considering the serious intensification of activities by those forces in the US that do not want any compromise with the DPRK and are not ready for any concessions. Their goal is to try and prevent Trump from reaching such an agreement and to exploit the failure of his foreign policy. Thus, the situation on the Korean Peninsula has become hostage to the US fleeting political interests. So what can Russia do under the circumstances? Up until now it emphatically welcomed the development of the diplomatic process, which meets its basic interests although it virtually took no part in it. There was no special need for that as the process was evolving without our participation, which was limited to consultations with all the stakeholders on the best ways of facilitating this process. Now active interference is becoming topical. The time is ripe for a Russia-North Korea summit to discuss what Russia can do to help improve the situation. It is necessary to prevent the reversal of this process so that it doesn’t return back to the “fire and fury” phase of the year 2017. American experts believe that such a threat does exist. In cynical terms, the current status quo, when both sides stick to their irreconcilable positions without any further aggravation, is quite acceptable to Russia, and not only to Russia. North Korea is not conducting any nuclear missile tests or being provocative. The US-South Korea maneuvers in the south of the Korean Peninsula have been discontinued, and inter-Korean cooperation is making headway. This is exactly a situation that allows us to hope for a positive scenario in the future. Its implementation is suspended due to the preservation of the sanctions but at least the current situation is not getting any worse. Russia still has a job to do when it comes to trying to help improve what is going on. The meeting between US President Donald Trump and North Korean Leader Kim Jong-un, held on 27-28 February in the Vietnamese capital Hanoi, was a disappointment. The parties announced that they had failed to reach an agreement.